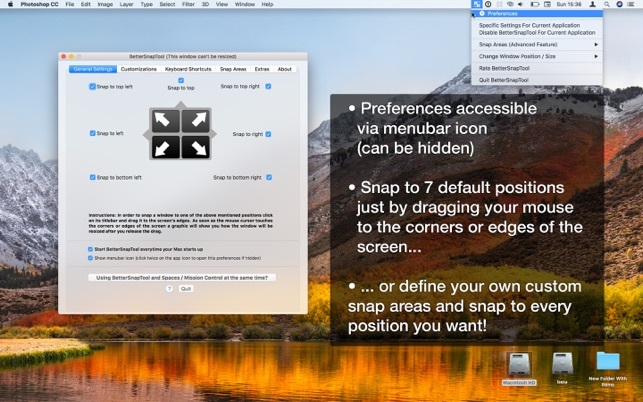 The standout feature from this app is the ability to create your own snap area. The snap area can be set up as a universal snap area that applies to all applications or for a specification application. I created a specific snap area for OmniFocus because the default 50% snap area is too small to display all the information that I need. The snap area prompt can be customized to your liking. 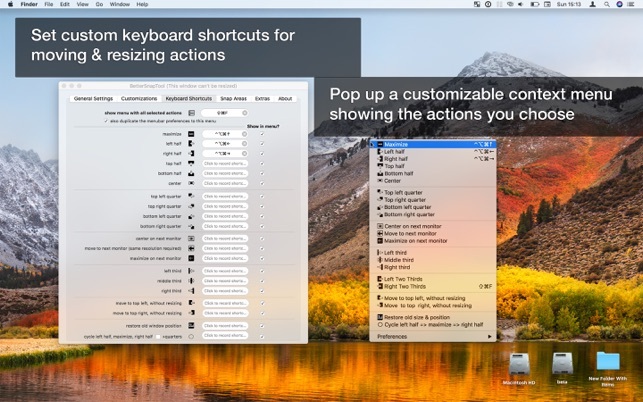 You can set the size, color, text prompt, visual prompt. I use a 22 inch monitor, but if I have a bigger monitor I will create more snap areas to optimize my desktop space. I tried out Moom and it was nice as well, but I think the grid system is a distraction. The grid system can be turned off, so it is not a big issue. Moom has a cool feature to save your windows layout. For example, you can set up a “work” layout with 3 windows for your most used apps. You take a break and opened email or browser and now your windows is disorganized. You can quickly return to “work” layout immediately by pressing a quick short cut or a menu button. Both apps are great but I love BetterSnap’s customization options. Being a long time Mac user that also does a considerable amount of work in Windows, it was blatantly obvious how much of a handicap not having snaps was for Mac OS. I began to despise working on my Mac anytime I needed to do any kind of multi-software tasks and really don’t like the the Spaces/Mission Control feature that separates applications into different windows. 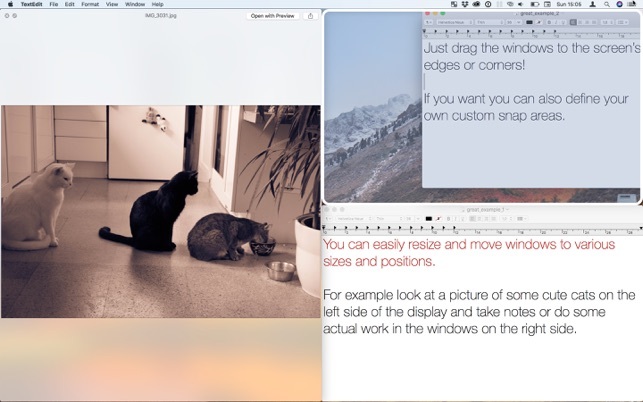 The BetterSnapTool has been the perfect solution for incorporating Windows-like snaps into Mac OS and has many additional features that really make it nice for customizing the location(s) off application windows. It does not have the same multi-step snapping features that Windows Snaps have (e.g. you can’t hold a modifier and hit the arrow kyes twice to have a window occupy two differnt spaces like you can in Windows). However, I have not found this to be a limitation at all. You simply set various window positions to unique key combinations of modifiers for each position on the screen. Once you train your fingers, the integration is completely seamless. Overall, this is the single best app I have ever purchased for actually improving productivity in MacOS. The developer has an instructional video showing how to use this app. Very helpful. It took less than two mintues for me to understand it, using the video. Once implementing a couple of drop zones that trigger a window layout, I quickly discovered that this tool saves a lot of time and energy. 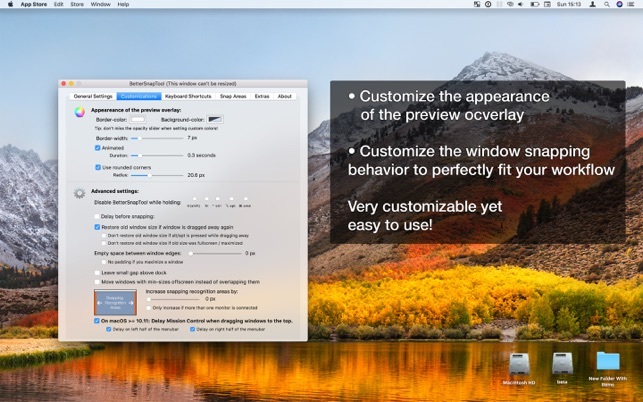 Less time manually resizing and coordinating finder and app windows is required as a result of this app. No software conflicts either. I also implemented an “extra” feature that comes included. I set up double clicking on the title bar to move the selected window to a specific area with a specific size. This gets me out of trouble when certain apps don’t play well with Mac Os and don’t properly switch out of full screen mode or won’t resize between screens easily. It’s also a quick way to get things out of the way. 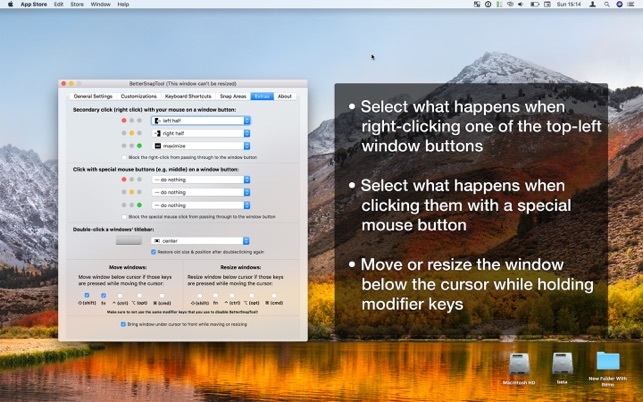 I make use of all trackpad gestures, and in any ways, this makes Mac Os a breeze. However, the addition of this app adds another level of convenience and organization. Impressive and convenient. Very happy with the purchase.